I meet Leo Limon beneath the crisp winter sun in a tiny pocket park at the end of Oros Ave in Frogtown. The pocket of land is called Steelhead Park, in recognition of the river’s indicator species, a trout that was last seen in the waterway in January of 1940. We had planned to meet at the capacious Los Angeles Public Library downtown but at the eleventh hour Leo sends me a message to meet here. Wear sensible shoes, he reminds me. Turns out his last interview experience was with an undergraduate who wore stiletto heels, a considerable impediment to scaling the sixty degree rip-rap banks in this stretch of the river. We’re here to talk, and to check in on one of Leo’s iconic River Catz, painted on a drain cover just here by the park. River Catz are a quintessentially Los Angeles River icon. In fact, there’s even a replica one painted on plywood board in the Smithsonian. You see, the stormwater drain covers along the river take the shape of a stylised cat face, with pointy steel-plate ears and a roundly-outlined face. Leo wasn’t the first to notice this, though he is the one who has become synonymous with it. Half a century ago, Leo was ten years old. His face was pressed against the window glass, peering impatiently at the river in search of something interesting on the way to the Los Angeles Zoo. He found it. 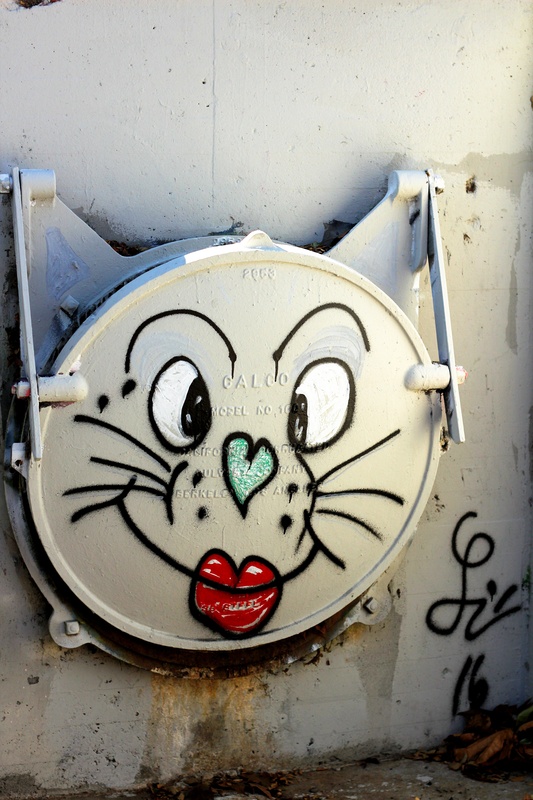 In 1960, Felix the Cat had been painted onto several drain covers, right there by the 5 freeway. Burbank housewife Mrs Jacqueline Meyer had, you could say, been vandalising property in the Los Angeles River. With a tin of paint and a brush bundled up in a brown paper bag, riding rental bikes, the Meyer family descended down into the river bed to commit what Mrs Meyer described as “facing, not defacing”. While it was an unconventional way to spend Memorial Day for this otherwise conventional family, human beings leaving their mark on the river is utterly commonplace. So, when Leo sees these Felix the Cat paintings from window, the seed is sown in his mind. Later, in 1970, Leo is a junior at Lincoln. He has a bunch of friends at Florence Nightingale Junior High. Both schools are east of the river, Nightingale a block north of the Arroyo Seco and Lincoln further south. To get between them on pushbike, your trail would take you close to the river, and so it became the middle ground place to hang out. There, he saw the same kinds of drain covers that Jacquline Meyer had painted near the 5, further north. 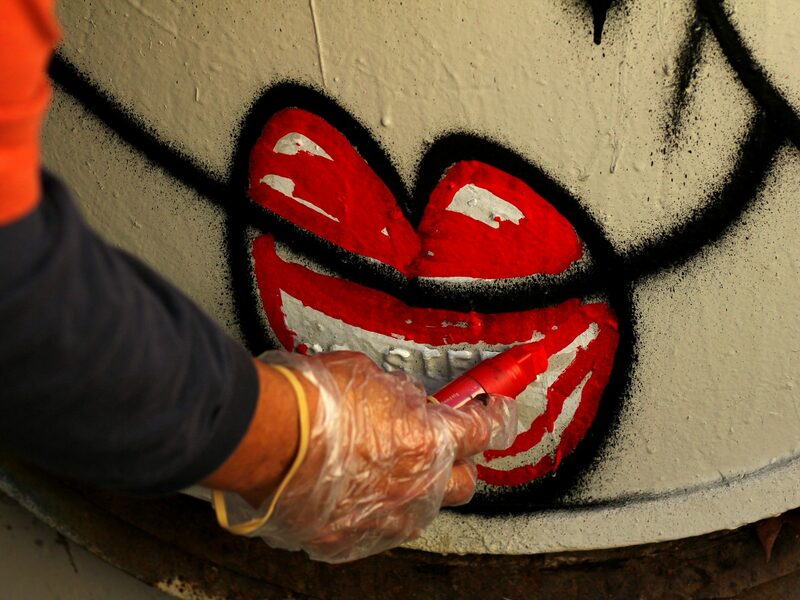 Already immersed in art, and advertising through an arts development program for teens, Leo started experimenting with making his own mark by adding animal faces to the drains. When we talk he recalls, with a click of his fingers, what he thought at that time: “Hey, I’m getting into art. Maybe I should start something with the cats. You know?” That something with the cats has persisted, creating a unique visual iconography for the river. Leo Limon, interview by Tilly Hinton, Friday 5 February, 2016, 2016, Digital Recording, Oros Street Pocket Park and adjacent river bank, Elysian Valley. Gumprecht, The Los Angeles River : Its Life, Death, and Possible Rebirth, 242. Leo Limon’s print work is in the permanent collection of the Smithsonian American Art Museum, and he created a plywood replica River Catz work for an exhibition titled ‘Reclaiming the Edge: Urban Waterways and Civic Engagement’ in 2013 at the Smithsonian Anacostia Community Museum. Jack Smith, “Confessing to the Cat Caper,” Los Angeles Times May 26 1975. Oral history interview with Saber, 2016. Oral history interview with Limon, 2016.